This afternoon yours truly spent the afternoon communicating with a number of public servants and getting caught up. 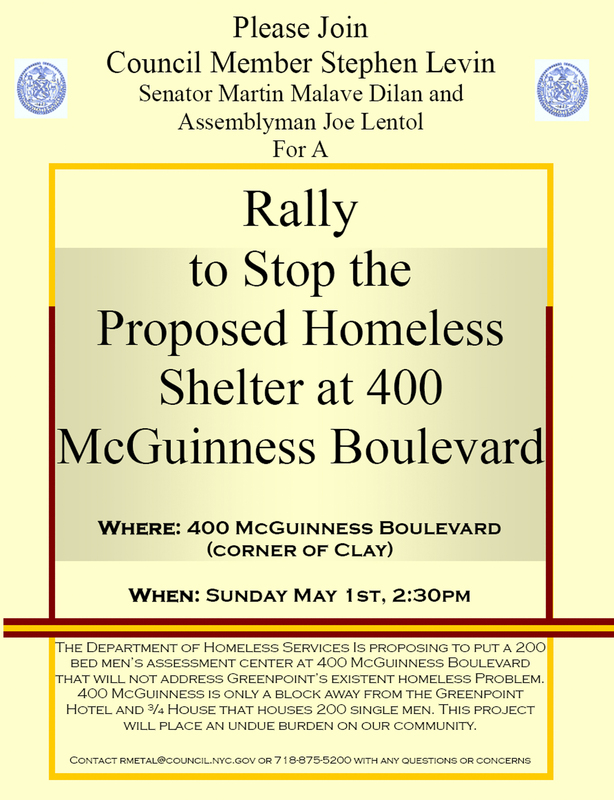 Once I thought my day was over I remembered one thing I forgot: getting a time and date from Steve Levin’s office regarding the rally he promised regarding the homeless assessment center at 400 McGuinness Boulevard. I am pleased to say his Community Liaison, Rami Metal, delivered! You can download a print quality version of the above missive by clicking here. 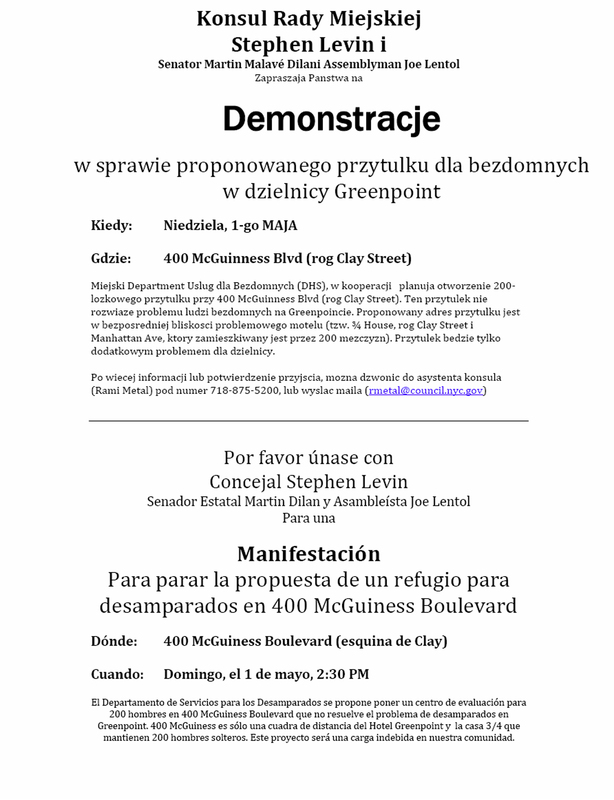 Otherwise, you can download a print quality version of their joint Polish/Spanish flier by clicking here. May 1, 2011 (May Day!) at 2:30 p.m. P.S. 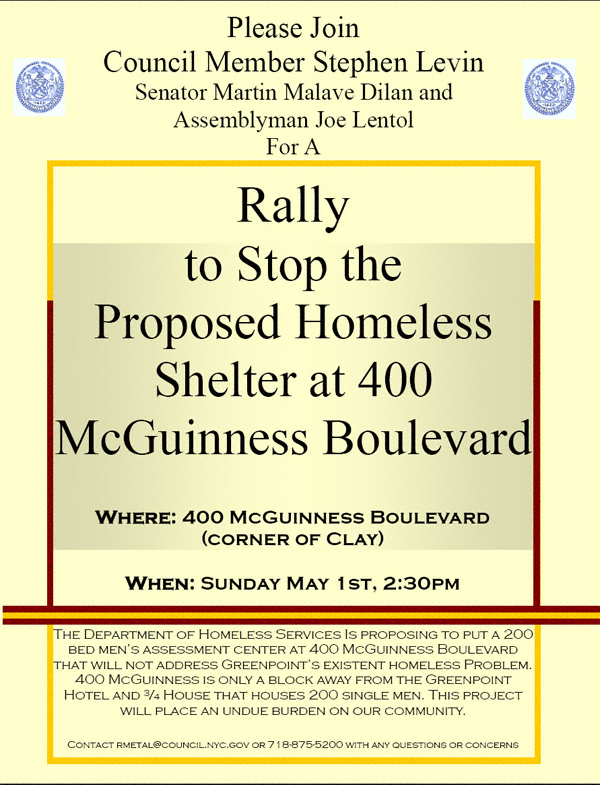 : Something I failed to note in this post is that this shelter has passed the “Fair Share” review by our fair city. Apparently being host to the largest sewage treatment plant on the Eastern seaboard; a lack of follow-through on the manifold number of promises made by our fair city during the 2005 re-zone (*ahem* affordable housing) and a rather problematic SRO and 3/4 house one block away does not preclude our community from bearing its “fair share”. Go figure. P.S. #2: Those of you who are so inclined might want to check out the New York State Sexual Offender Registry for 11222. What you will find is interesting— and very disturbing. Tip: look at 1109 Manhattan Avenue and 66 Clay Street.